If author Dan Brown did online slot machines we imagine they’d look something like Secret Code. Powered by Net Entertainment and based on the mysterious world of the illuminati, this 5 reel, 20 payline video slot comes with stacked wilds, a creepy pick me round and a bonus feature that awards up to a dozen free spins with multipliers that can reach 20x. Play from between 20p and £50 per spin. Set in a crypt style building and overlooked by statues of angels and demons the reels include a trio of mysterious seals, red, yellow and green rings, an hourglass, an old manuscript and the ageing detective and his young assistant. Land 5 of the dapper looking sleuth for a payout of some 4,000 coins. The knife-wielding monk is the game’s wild – he appears on the middle 3 reels only and when he forms part of a winning combination, he will expand to fill the whole of the reel. There are 2 bonus features available in Secret Code – land the key and lock bonus symbol on reels 3, 4 and 5 and you’ll trigger the Bonus feature. You’ll be taken to a new screen and presented with 5 masked statues, each of which is holding a treasure box. Drag a key onto the box – if it opens and the mask from the statue cracks to reveal an angel, you’ll receive a cash prize. If the statue reveals a demon though, you won’t win anything. After all of the bonus prizes have been awarded, you’ll be given a shot at doubling it. You can gamble all or half of your payout if you’re feeling lucky. Secret Code also comes with a Free Spins feature which is triggered by landing 3 or more of the scatter anywhere on the reels. Click on 1 of the scatters to reveal the number of free spins you’ve been awarded – up to 12. Your wins during this feature will benefit from a multiplier. Every time 2 or more scatters land, the multiplier will be boosted by that number of scatters with multipliers of up to 20x are possible here. The masked monk expanding wild can appear during the feature and it’s possible to trigger the Bonus feature from here too. 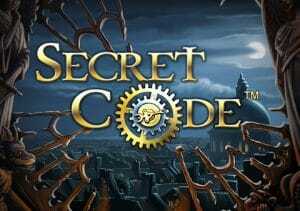 The design of Secret Code has a suitably sinister feel, backed up by an excellent backing track filled with haunting Gregorian chanting. As far as volatility goes we’d put Secret Code in the medium to high range. There’ll be spells when you’ll think the secret rulers of the world have purloined your bankroll. Get lucky with the multiplier in the free spins though and you can win big quickly. If you enjoy a good conspiracy theory, then Secret Code should be to your liking. Unlock this code and treasure could be waiting – the game is often overlooked though which is a pity. I suggest you try some of the NetEnt’s early games with the high variance Piggy Riches an excellent choice.